If, as Pope Francis has recently said, “The style of the good God is not to produce a spectacle”, that “God acts in humility, in silence, in the little things”, then that should be good enough for me as well. Yesterday I was shocked to read in the news that a popular former blogger whose blog I used to read and enjoy, and whom I once met and spoke with, is suspected of having poisoned her chronically ill youngest daughter. She is a gifted writer and photographer, and when I was reading her blog regularly a few years back I admired her talents and growing success, while feeling sorry for her sick little girl and their whole family. Now the child is in the care of the state, the blog has been closed down, and the mother is facing charges of abuse. This terrible news reminds me that what is really important, and most authentic, is who we are before God, not men, and that Scripture tell us God prefers the little, the humble. I should be content with doing a little work each day, one task at a time, simply and without overburdening it with either hopes or anxieties grounded in comparisons. I should never wish for another’s apparent success, or measure my life against another’s by judging from the outside. If you will, please pray for the little girl and her family. 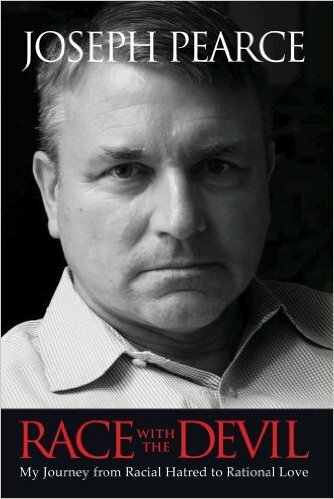 The photo only seems a bit random – one of my little jobs this week was to read this autobiography of former white-supremacist-now-Catholic-author Joseph Pearce.